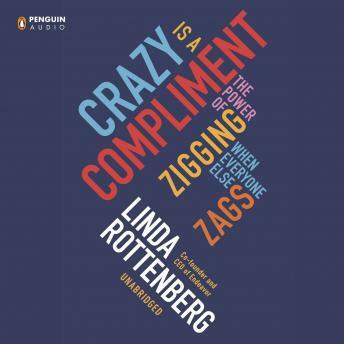 Linda Rottenberg has spent her career helping innovators think big. “If people aren’t calling you crazy, you aren’t thinking big enough,” she says. These days taking chances isn’t just for young college dropouts in hoodies. Whether you work at a Fortune 500 company, a non-profit, or a mom-andpop store, everybody needs to think and act like a changemaker. We all need to be nimble, adaptive, daring, and maybe even a little crazy, or risk being left behind. But how do you take smart risks and still achieve big success? That’s Rottenberg’s expertise as the CEO and cofounder of Endeavor, the world’s leading organization devoted to identifying, mentoring, and investing in fast-growing businesses. Since 1997, Endeavor has screened 40,000 candidates and handpicked 1,000 entrepreneurs in 20 countries —then helped them take the crucial steps to grow their organizations and transform their communities. In 2012, Endeavor entrepreneurs generated $6 billion in revenues and provided 225,000 jobs.